Something Never Changing, Something ever Changing. While the times have drastically changed since the establishment of "Fujiya" in the Edo era, one thing has remained constant: our commitment to excellence in hospitality. Spanning the Meiji, Taisho and Showa periods, "Fujiya" has continued to provide the highest level of customer care originally lavished on Daimyo Lords of the Edo era. This prestige has been passed down in both name and reputation. 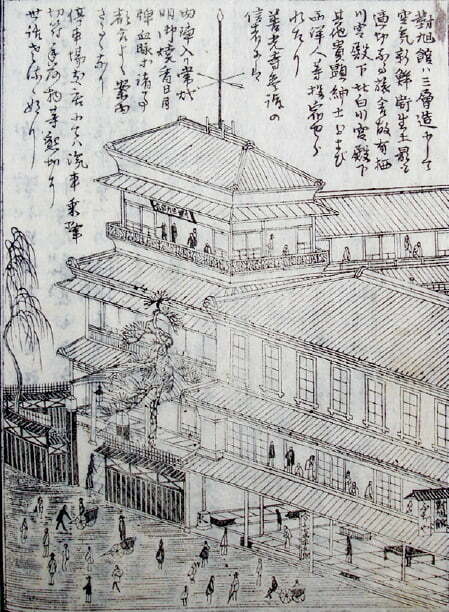 The word "Gohonjin" originally referred to an official residence for lords. In the edo period around the 19th century, provincial lords were ordered to serve the central military government every other year as known as "SANKIN-KOUTAI." They went back and forth between their territory and the capital (Tokyo) once a two years. On the way, they needed the residence to stay. Established in the Edo era as Gohonjin Fujiya, "Fujiya" regularly played host to the feudal lords of the Maeda family who ruled the Kaga territory. In recent times, it has attracted celebrities and prominent local figures, including princes of the Arisugawanomiya the royal family, Hirofumi Ito (four time Prime Minister during the Meiji period), Yukichi Fukuzawa (the founder of Keio University). 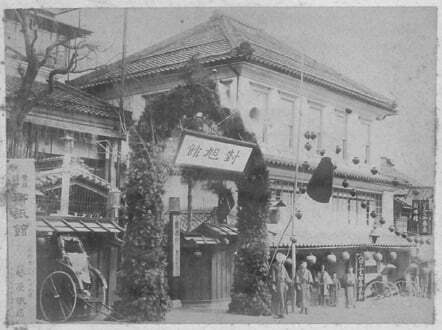 The main ryokan was located in Daimon-cho. The three story European architectural design along with a Japanese-style tower was of great surprise to the public especially at then. Two great trees, a pine and a willow, were situated on each side of the front gate, and all who passed by would stop for a moment to take in its splendor. 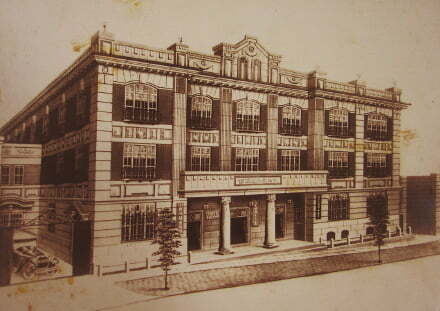 Its branch was another three-story building, located farther down the street near the Nagano station. 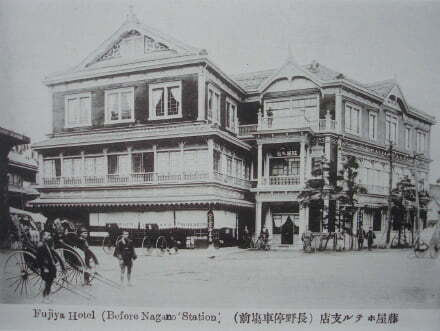 The Taikyoku-kan Fujiya Branch was another three-story building which was located father down the street as you approached Nagano station. 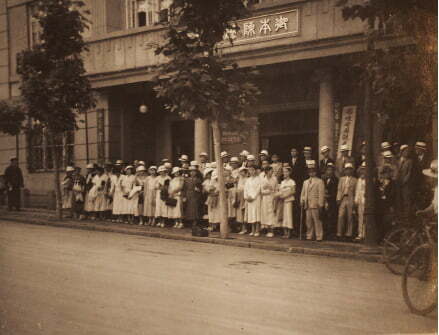 Shozaemon Morota was commissioned to modernize and renovate the building in 1925. His design is a stunning example of Taisho architecture which blended elements of Japanese and Western style. Morota was a highly skilled Japanese carpenter, or Miyadaiku, who lived in Echizen, Fukui. He was also appointed to renovate Nio-mon, the Deva gate, of Zenkoji Temple, designated as a national treasure. The Art Deco design of the Gohonjin building is gorgeous enough to fascinate people of all ages. Take a step back in time as you enter the building to an era which has since become synonymous with taste and refinement, representing the integration of the sukiya style building and the atmosphere and culture of the Taisho period. The Japanese garden reflects the seasons to bring you peace and tranquility. With the beauty of its western style architecture, Gohonjin has long drawn admiration from the public, and has become a conspicuous modern landmark on the street with its good old white wall buildings. The best quality hospitality has been passed down from generation to generation for more than 300 years. The more you learn the history and the process of our evolution, the more you know the reason why celebrities have loved us for such a long time. In the spring of 2006, we started a new chapter in our history when we modernized and reopened as "THE FUJIYA GOHONJIN."